Whether you fish for Perch, Trout or Pike, it's worthwhile having a good selection of lures to adapt to the conditions. Having different weights, colours, action in the water and designs can make a big difference. The Stillwater range of Tobix, Dropspin and Mepspin lures are very effective variations of the the original Toby, Droppen and Mepps lures but equally as deadly. In addition, they are very affordable and sport reliable, quality materials and treble hooks to give you the confidence when fishing for your target species. 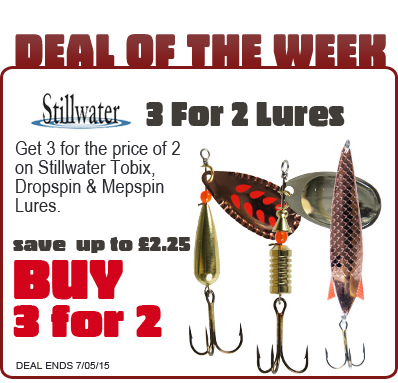 Don't miss this excellent offer where you can now buy 3 for 2 on these superb quality lures. Stock up now while stocks last!